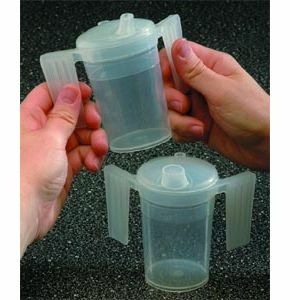 These two handled feeding beakers are designed to assist and encourage self-feeding. Thanks to their unique handle design, users are able to hold and drink from them unaided. The handles are large and flat and allow users with even a poor grip to get their hands into a comfortable holding position. Supplied with a lid with a small 4mm spout that allows a more controlled flow while helping to prevent spillage.